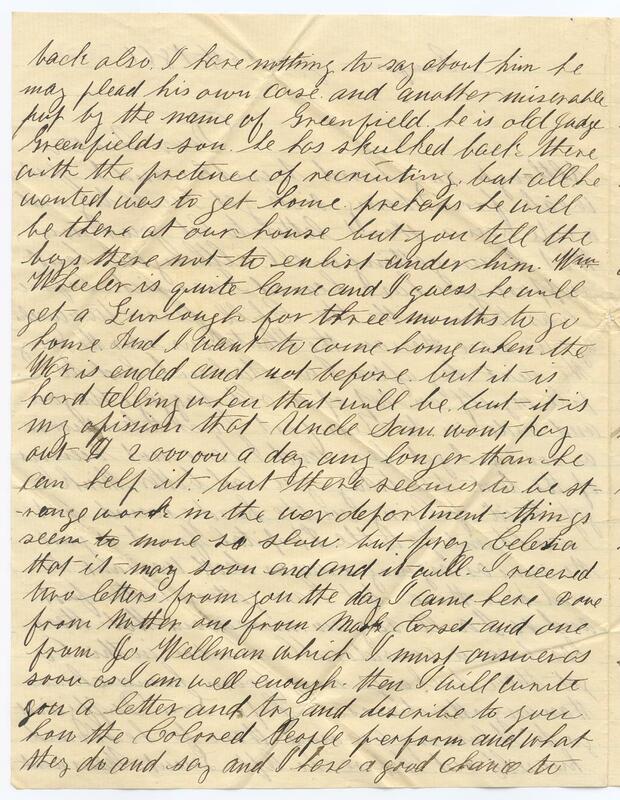 Item description: Letter, 26 January 1862, from Emmett Cole, a Union soldier in Company F, 8th Michigan Infantry Regiment, to his sister Celestia. 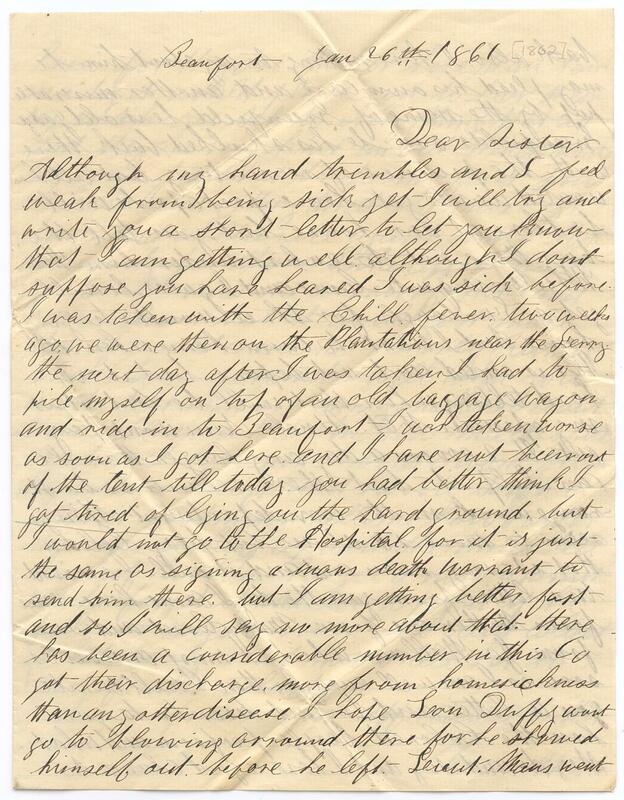 Cole wrote from Beaufort, S.C., where he had gone to recover from the “chill fever.” In this letter Cole criticizes the soldiers from his company who have returned home already, discharged for homesickness, but he remains confident that the war would end soon. Cole also expresses continuing curiosity about the former slaves and their interactions with the Union Army. Item citation: From folder 2 of the Emmett Cole Letters #5002-z, Southern Historical Collection, Wilson Library, University of North Carolina at Chapel Hill. Although my hand trembles and I feel weak from being sick yet I will try and write you a short letter to let you know that I am getting well although I don’t suppose you have heared I was sick before. I was taken with the Chill fever two weeks ago. we were then on the Plantations near the Ferry. the next day after I was taken I had to pile myself on top of an old baggage wagon and ride in to Beaufort. I was taken worse as soon as I got here. and I have not been out of the tent till today. you had better think I got tired of lying on the hard ground. but I would not go to the Hospital for it is just the same as signing a mans death warrant to send him there. but I am getting better fast so I will say no more about that. there has been a considerable number in this Co that got their discharge. more from homesickness than any other disease. I hope Leon Duffy wont go to blowing around there for he showed himself out before he had left. Leieut. Mans went back also. I have nothing to say about him he may plead his own case and another miserable pup by the name of Greenfield. He is old Judge Greenfields son. He has skulked back there with the pretense of recruiting but all he wanted was to get home. prehaps he will be there at our house but you tell the boys there not to enlist under him. Wm. Wheeler is quite lame and I guess he will get a Furlough for three months to go home. And I want to come home when the War is ended and not before. but it is hard telling when that will be. but it is my opinion that Uncle Sam won’t pay out $2 000 000 a day any longer than he can help it. but there seemes to be strange work in the war department. things seem to move so slow. but pray Celestia that it may soon end and it will. I receved two letters from you the day I came here, one from Mother, one from Mark Corset, and one from Jo Wellman which I must answer as soon as I am well enough. then I will write you a letter and try and describe to you how the Colored People perform and what they do and say and I have a good chance to know for they are thicker here than hair on a dog. It would please you to hear them say no Sah, yes Sah to every thing that is said. they are very kind. an old Wench made some tea that broke my fever. now Celestia I am getting tired and must lie down and will write again soon I look anxiously for those Likenesses. I wish you could send me a pair of socks and your Gloves but it would cost more than it would come to. Charly Runion sticks to us yet and is well. when you write tell me how mony matters are out there tell me what Andrew Millers folks are doing. I have not heared a word from them since I left and I wrote Sarah a letter at Washington. tell me how Father manages to keep up with the times. tell him if Barlow has got a note against me he forget it and not to pay it if he feeles so mighty crank he cant collect it. Let Cary read this & tell her to pray for the volunteers. 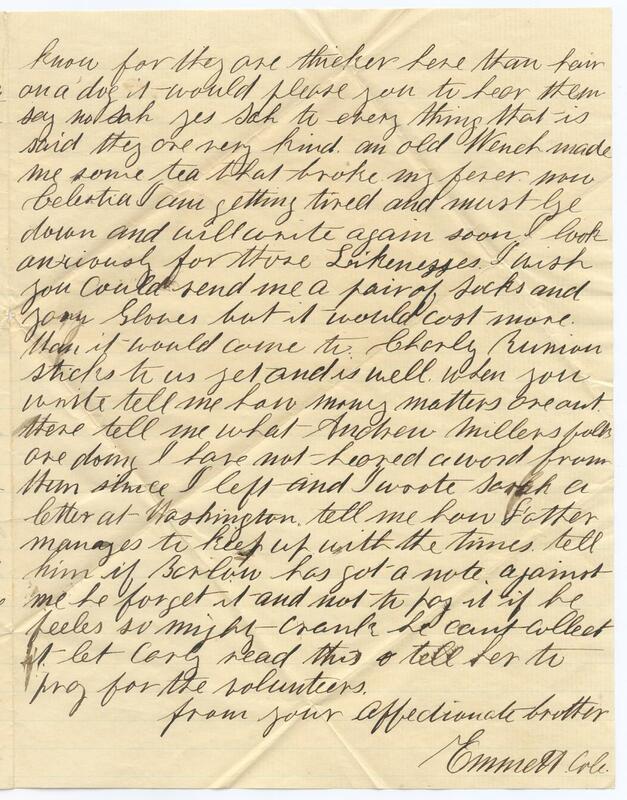 This entry was posted in Southern Historical Collection and tagged 8th Michigan Infantry Regiment, Beaufort, Emmett Cole, homesickness, hospitals, sickness. Bookmark the permalink.